Bollington Festival Choir was founded in 1964 by Dr John Coope MBE (1928-2005) who conducted it for 37 years before handing the baton to Donald Judge, a member since 1976. Known for its friendly atmosphere, new members and audiences are assured of a warm welcome. Anyone can join without audition, and there are also regular opportunities to participate in Singing Days and Messiah for All. 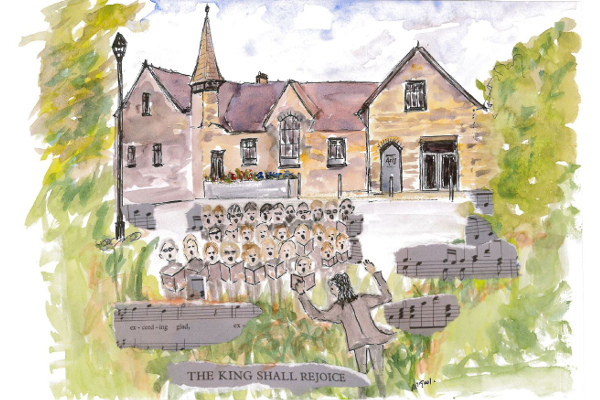 Known as a lively part of the community, the Choir performs several times a year in Bollington, but also attracts singers and audiences from the wider area. Known for its adventurous programming, the Choir’s repertoire blends well-loved composers and pieces with the less familiar and the contemporary, including occasional works specially written by Donald Judge. The Choir has an excellent accompanist, Rosalind Hall. As well as soloists from the Choir, outstanding young vocalists from the Royal Northern College of Music and an accomplished orchestra are engaged for at least one concert a year. Forthcoming events at the Arts Centre feature on the Events page and in the published brochure. For all Choir events, the current season’s leaflet, and full information please visit the Choir’s website or call 01625 511881.